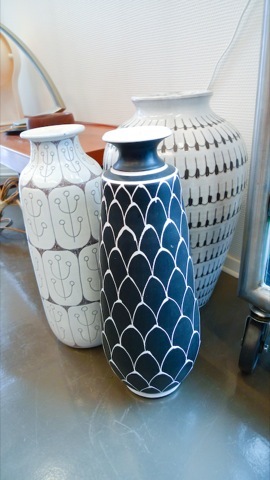 We found some great finds in Stockholm at the Stadsmission while we were waiting for our boat to Helsinki. We haven’t had as much luck as we’d thought while we’ve been on this trip, so this was a rare occurrence. 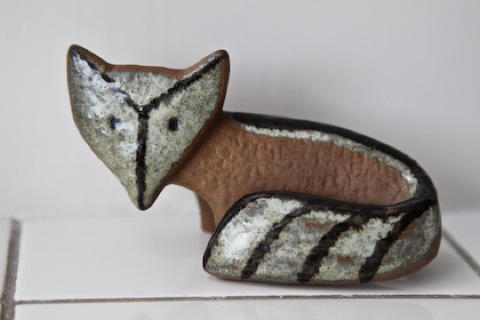 I picked up a beautiful ceramic Fox, designed by Lisa Larson in 1955 for Gustavsberg’s Lilla Zoo series. I’ve always wanted one, so I had to pay more than I would have wanted. $60 cringe… I just wanted to have a souvenir from Sweden. 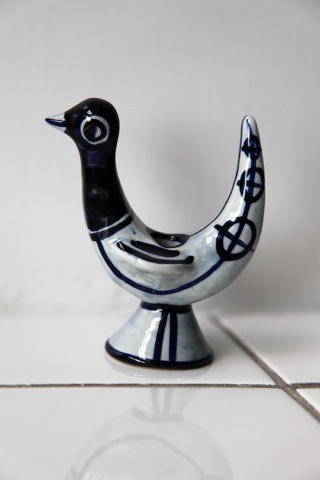 We found a folksy bird candle holder from Denmark, only 2 dollars. 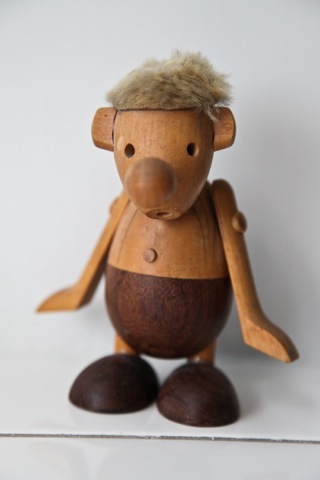 We were especially excited about this 1950s Danish toy by Hans Bolling, only 4 bucks! What are the odds of finding an Arabia plate the same year as Juli’s birthday? Pretty good apparently since we got this one for around 8 bucks. 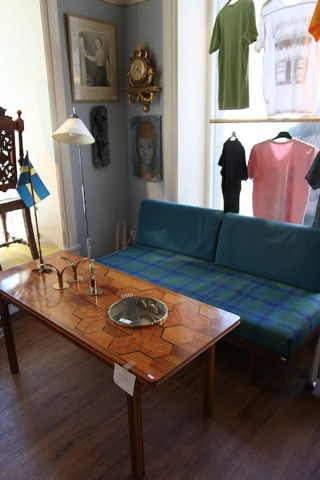 This is Jacksons, and this is the reality of vintage in Scandinavia. 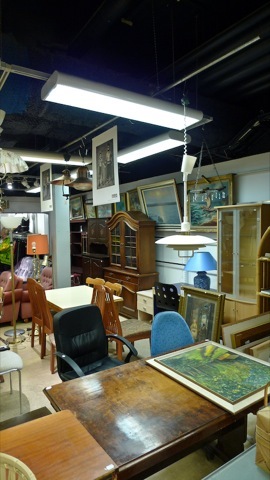 The showroom was beautiful with some amazing pieces that were so expensive you would think that they would have no business and have to close down. 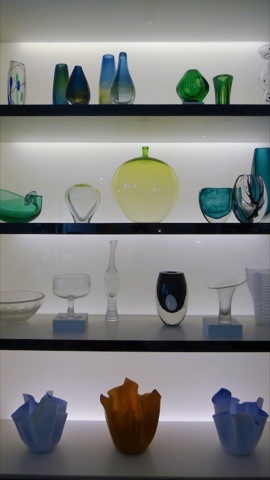 That glass apple there is designed by Ingeborg Lundin for Orrefors in 1955, it is an extremley rare example and are known to be sold anywhere between $6000 to over $10,000. Maybe if I get an honorary doctrine in Scandinavian design history I’ll treat myself to one of these. 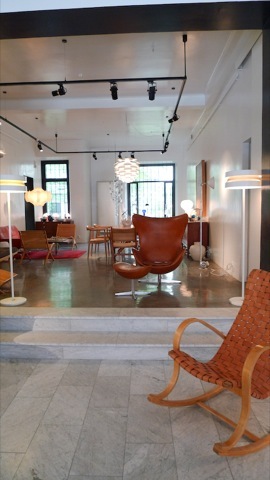 Wowzers, a leather Bruno Mathsson rocking chair, Arne Jacobsen egg chair, and Poul Henningsen artichoke light. How can you afford insurance on a place like this? My dream dining chair by Poul Kjaerholm, unfortunately at $6000 a piece, (fritz hansen pricing) I will sadly never own even one of these. This is more our speed! This is the Stockholm Stadsmission, and we went to every one in Stockholm with absolutely no luck. Until we came to the Gamla Stan location (old town). It was raining all week, but the sun came out for our last day in the city. 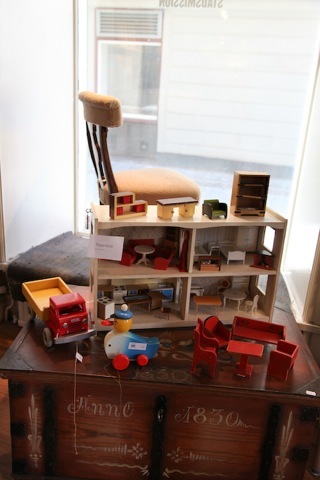 Really cool Swedish toys, next time we need to bring a bigger suitcase so we can have an excuse to buy things like this. Also, children. That teak sofa was only $120! 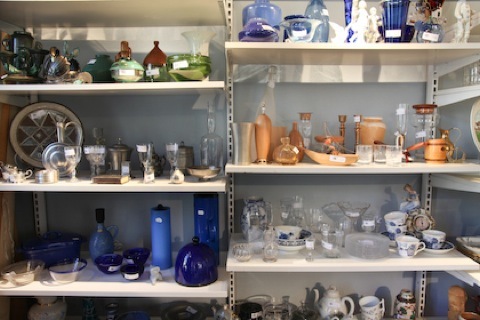 Can you spot the blue Stelton vacuum jug? It was a bit out of our price range at $35. 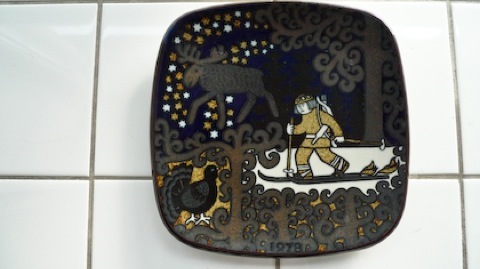 There seems to be cool art everywhere, but we don’t have the space to lug it around with us. 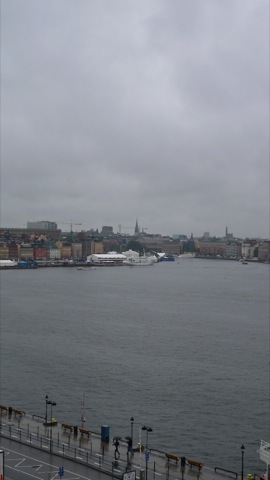 Ok seriously, it has rained now for three days straight in Stockholm. John’s shoes are soaked right through (thankfully I picked up a pair of Ilse Jacobsen rain boots–the short ones–in Copenhagen) and the heavy clouds are seriously bumming us out. We haven’t been taking many photos or doing much at all really. 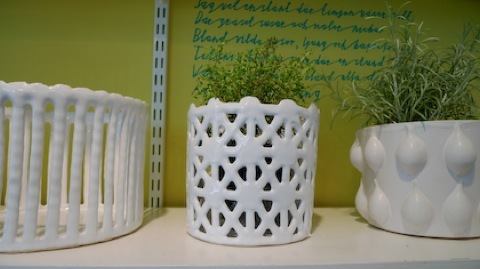 A couple of days ago, we stumbled across a really nice ceramics shop called Blås & Knåda. 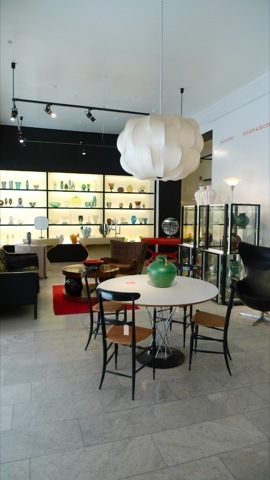 It’s located along Hornsgatan in Södermalm and has lots of locally produced ceramics (there are numerous artisan shops along Hornsgatan). 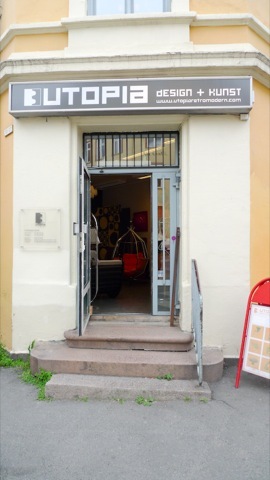 Also along Hornsgatan (and in other locations) is the Stockholm Stadsmission, kind of their version of Goodwill. 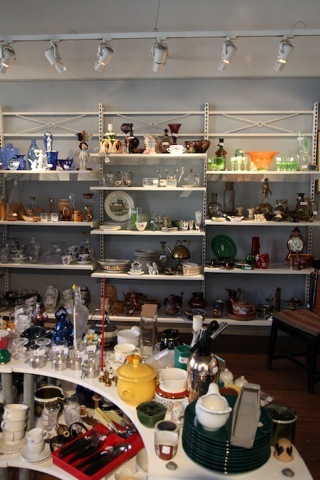 These types of shops throughout Scandinavia are blowing our minds, not because they necessarily have tons of amazing stuff but because of how they are run. 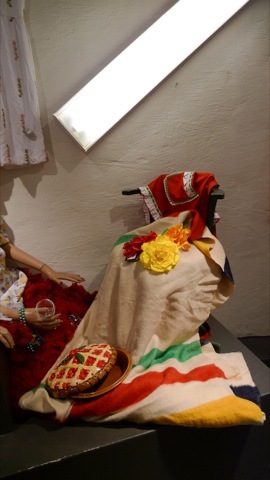 They seem to hire young hip people to run the shops, curating objects and making pretty amazing displays. 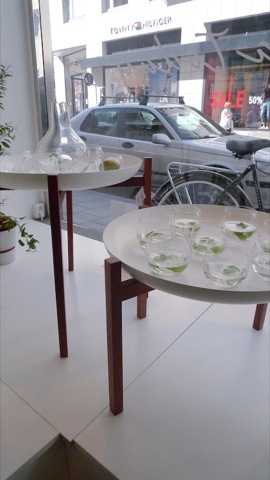 There was one shop in Oslo that had the most thought out window displays. 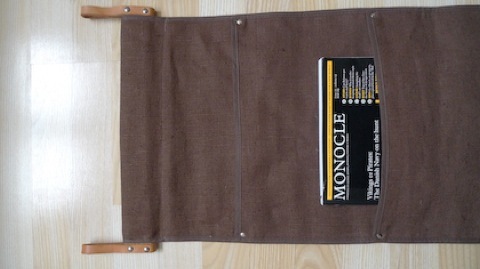 They also usually have a section where there are redesigned clothes (take the old and remake it). 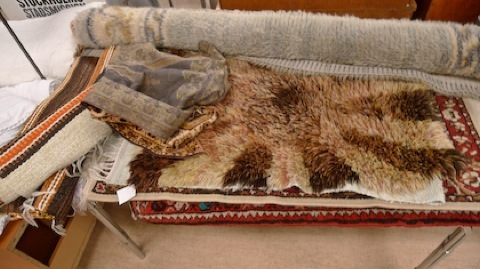 Too bad the rugs are always BROWN. UGH!!!!!!! 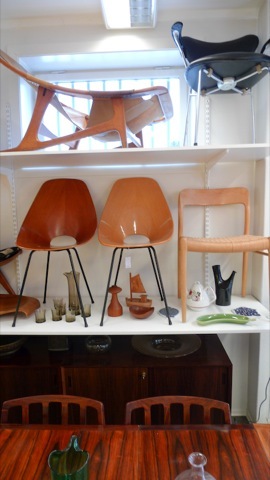 Everything vintage is always brown! There’s a cool white pendant light hiding out in this photo somewhere. Time for a break! 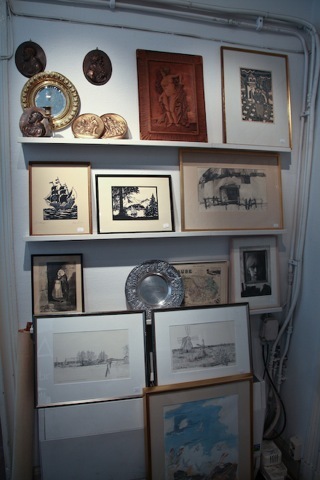 I highly recommend visiting a Konditori if you are ever in Stockholm. They are basically an old timey styled lunch and tea time place, with premade sandwiches, tea, coffee and pastries. 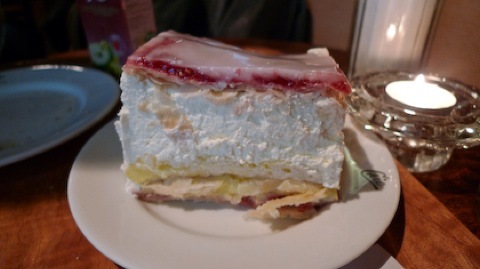 I was on the hunt for my favourite pastry in Stockholm, the Napoleon. YUM! This was my second attempt at getting a Napoleon. The day before we went to the same Konditori (one of the only ones I know–Chic Konditori) and they didn’t have any. Let’s just say I pouted for a considerable amount of time. Thankfully on Saturday they had them. 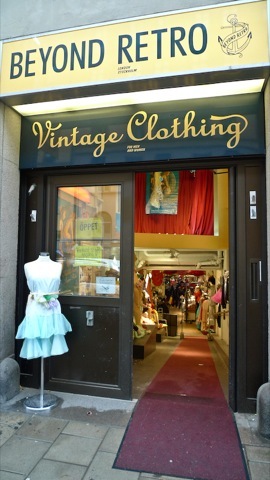 Off to Sofo (South of Fokunsgatan) where all the vintage clothing shops are. 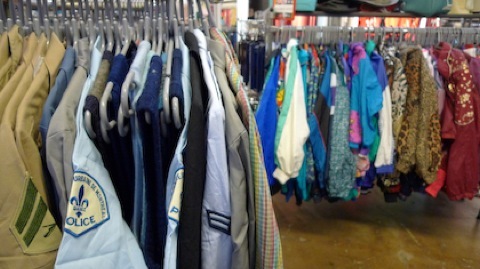 Ok kids, have you been wondering where all the great vintage clothing has gone in Toronto? Because I have for quite some time. Turns out it’s going to Sweden! SWEDEN! What a travesty. Like these people aren’t already dressed well enough. They have to go and take all our cool fitted leather jackets and HBC Point Blankets. Whhhhaaat? And this place is huge. Sigh….I don’t even have the time to give it a good look. 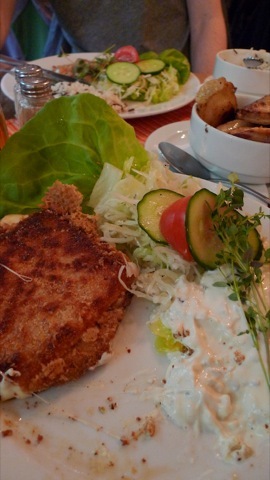 We grabbed dinner at a favourite restaurant of mine, Krogen Soldaten Svejk. It’s a czech restaurant and super popular with local Stockholmers (not so touristy, though they do have an english menu). Mmmm…fried cheese and ham, with tartar sauce and fried potatoes. Ok not so healthy. John had some sort of chicken and rice combo. 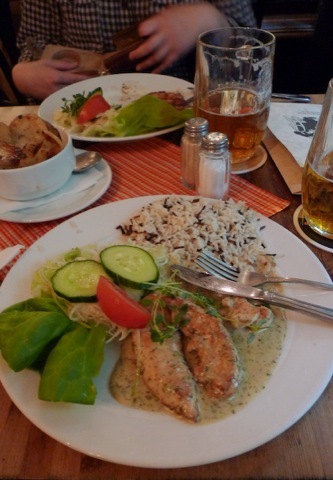 We started with the goulash which we highly recommend. Forgot to take a photo of it but it was amazing! Anyway, as you can see we’ve been kind of bumming around. The rain is making it super hard to really do anything. I’ve been to Stockholm twice before, and it truly is one of my most favourite cities. It’s just got that je ne s’ais quoi, like NYC and Paris. When people ask me what it’s like, I just say it sparkles. There’s this unique (and often blinding) quality of light, probably from all the water that surrounds the islands, that is special. John suggested it’s like a white light, which I am inclined to agree. We splurged a bit on accommodation this time, mostly because I spent a day looking for something affordable and not sketchy and came up with nothing. 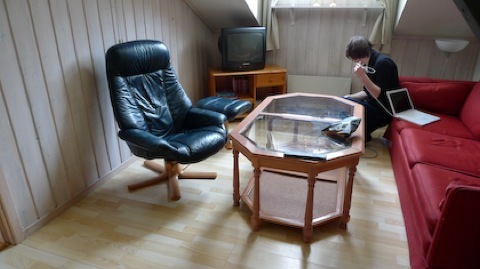 So we got an actual hotel room at the Nordic Sea Hotel (I scored an online special). Personally, I often like to stay near the central train station, because everything is accessible from there and when you keep adding baggage to your entourage like we are, it helps to only be a short walk to the hotel. Unlike our experience in Oslo, the room was ready for our arrival at 10am (oh by the way, we flew Norwegian from Oslo, about $60 per person and a smooth ride it was). Since I sprained my ankle, we spent the day close to home base, in the City Center. I did a bit of shopping at Topshop (which was stupid since they mark up the prices for importing it into Sweden) and at MTWTFSS Weekday (I think it’s a part of Cheap Monday, if I do recall correctly) along the main shopping street Drottninggatan. Then we headed over to the luxe department store NK (Nordiska Kompaniet) to get my boots fixes, as I had lost a part of my sole, probably when I tripped. 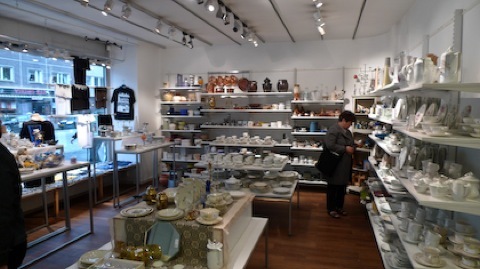 Then it was off to find Design House Stockholm. 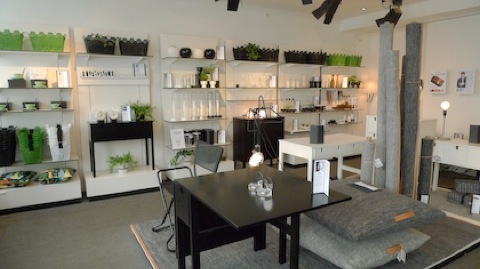 Design House Stockholm had some beautiful objects, featuring a lot of freelance designers from Sweden. We were kind of bummed to find out that most of the products were made in China. 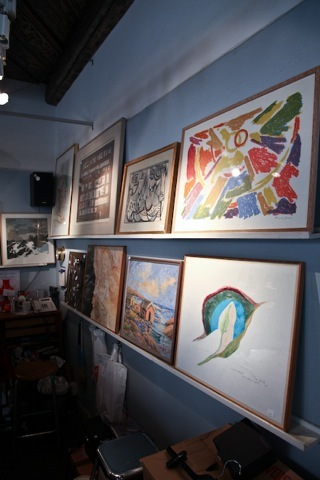 A Stig Lindberg print, they sell pillows with this print that are all screened in Sweden. We really loved the oil & vinegar cruets, teak trays, and the award winning Whale tongs, where a percentage of profit goes to the “Save the whales foundation”. 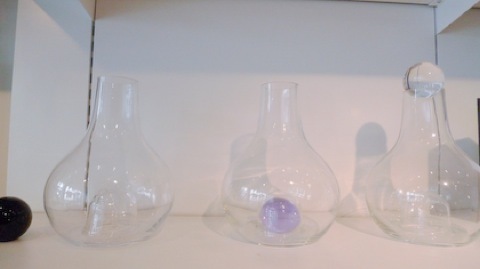 The stoppers of these carafes sit ingeniously in a groove underneath the glass. This table looks great inside or outdoors. I’d like to see it used as a bird bath, minus the West Nile disease. 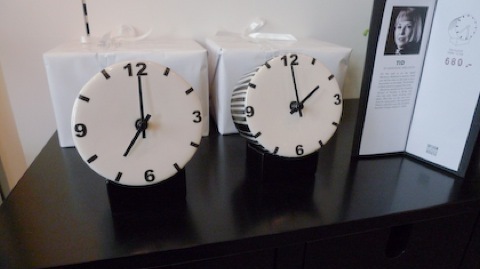 A set of hand painted bone china. We were going to grab a steamboat ride into the archipelago in the evening but found out that the restaurant on board was fully booked. Looks like we might miss out on this adventure as the weather has taken a turn for the worse–dark, gloomy and rainy for the rest of the weekend. 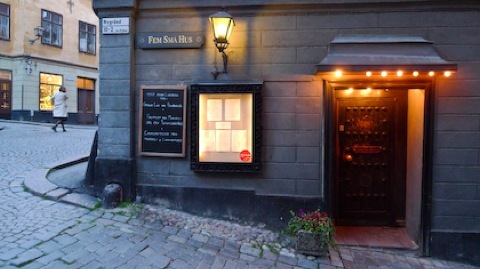 So we asked the hotel concierge where to get some authentic Swedish food and she sent us over to Fem Små Hus, in the Gamla Stan area (old city). S.O.S. appetizer. 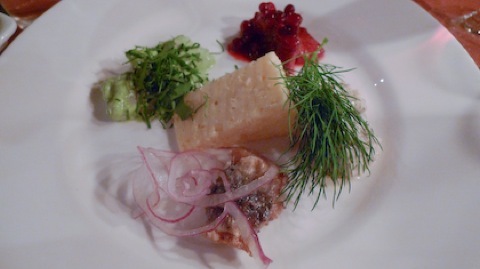 Herring in four different sauces/styles, accompanied with a bit of sharp cheese. This dish was amazing. 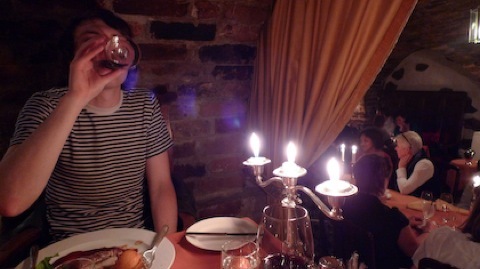 The restaurant is underground, in a bunch of chambers–cozy and intimate. Sorry, this is the point when we forgot to take a photo BEFORE we start eating. 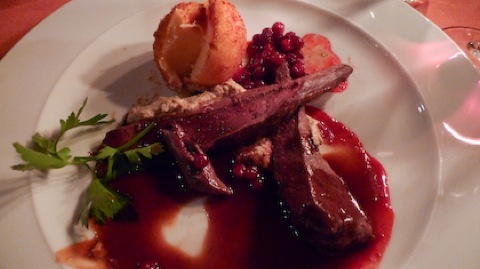 This dish was recommended by the concierge, so we both got it: Fillet of reindeer with mushroom crème, Port wine sauce, root vegetable croquettes and spicy lingon berries. 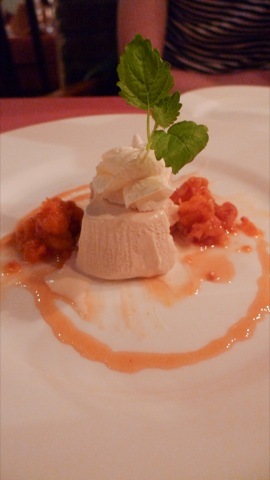 White chocolate parfait with raw stirred cloudberries. This dinner runs a close second to our Alberto K experience. Olso was a bit of a headache at times (like when Juli face planted into a bike lane, spraining her ankle and shredding her knee), but it was by far the best for thrifting. We got some great finds for under $25 bucks. The scolding grandmother we found for 5 bucks. 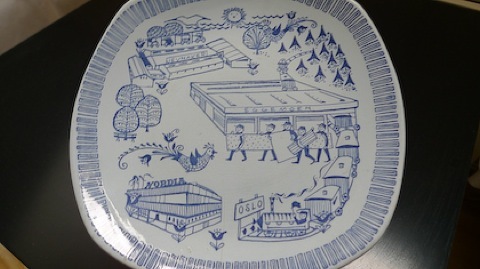 We’re still trying to find out where it was made, we saw a few of these in Denmark already. 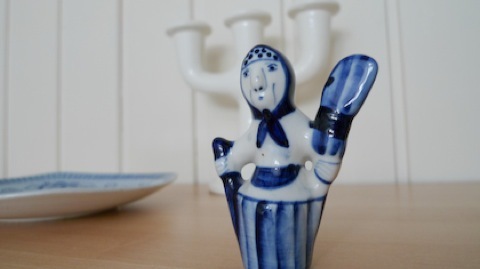 This candle stick was similar to the one in Copenhagen, it has a blue stamp on the bottom and was only $4. 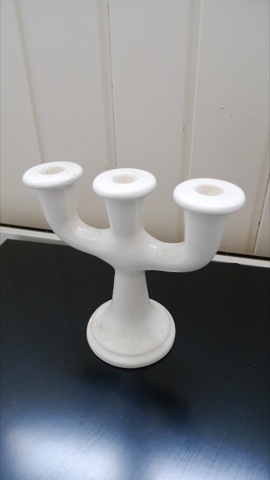 It reminds me a little of the Raw Candelabra by Jens Fager. It also could be from a 90s department store, we don’t really care. 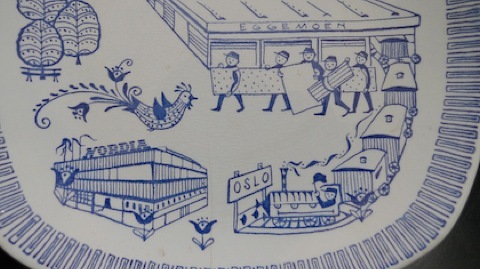 This was a really cool plate that features some of Oslo’s iconic areas, it was modestly priced at $12. 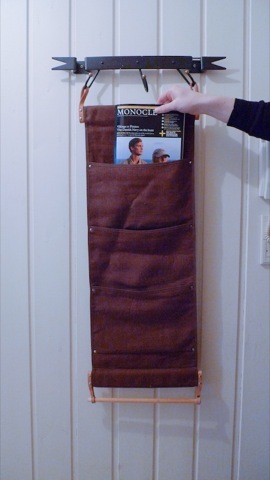 We found this great canvas organizer for a mere $2, it’s made in Denmark and will definitely come in handy at the cottage. All of the above items were from a store that is equivalent to Goodwill. 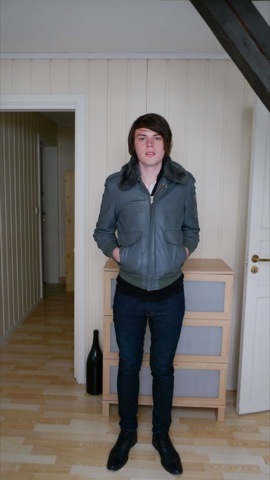 I got my leather on with this vintage bomber jacket, everyone here wears leather jackets! There are even some cool vintage shops that take old leather jackets and repair them, add hoods, and cool purple linings. This jacket was $100, but it’s hard to find fitted jackets, plus it’s versatile! The fur is easily removed. Also, can I remind you of the cool factor? There’s nothing cooler coming back to Canada with some vintage Norwegian leather. 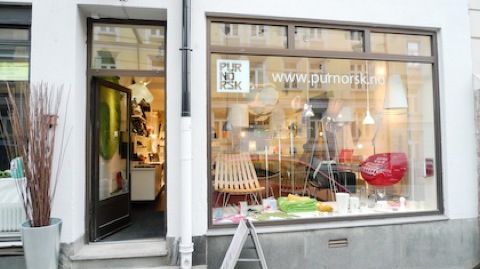 We took a visit to PurNorsk. If you go to Oslo it is a must visit. 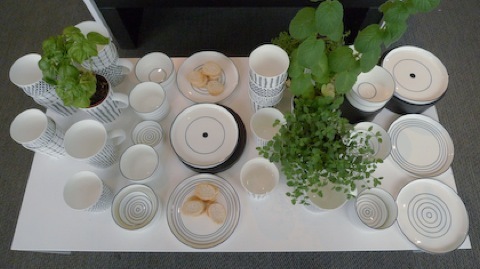 Everything here is by a Norwegian designer, right down to their typeface. 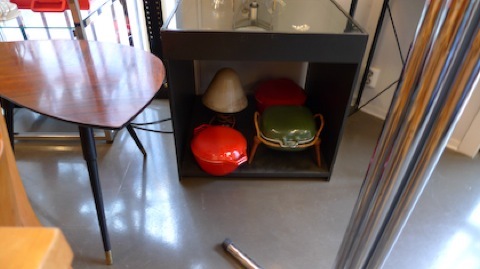 You can find anything from the Scandia chair to illuminated plastic moose heads (for the outdoors no less). 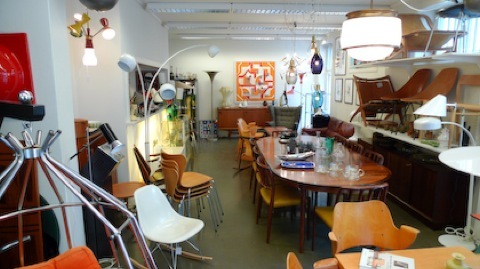 Utopia is one of Oslo’s best vintage furniture stores, it was highly reccomended so we just had to check it out. 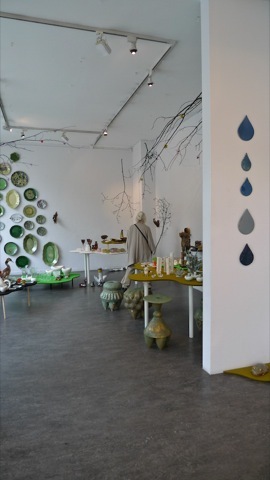 There were actually a few great shops along the way that had some wonderful Cathrineholm pieces, that I really should have photographed. Next time! If you’re in the area the street is called Markveien, in the hip indie Grünerløkka neighborhood. Lot’s of good stuff here that you won’t find in Canada. 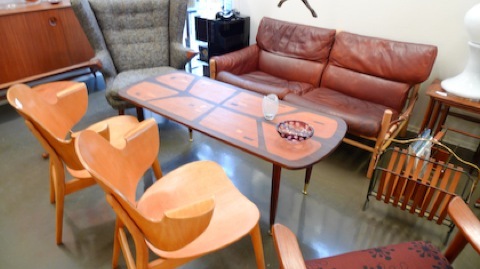 That coffee table was amazing in person, and matched with that leather chair… My god. 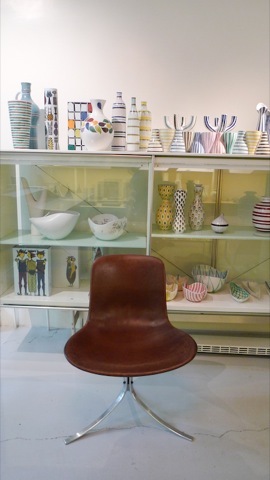 Those molded birch chairs were also very beautiful, they reminded me of Robin day, but they’re from Denmark. 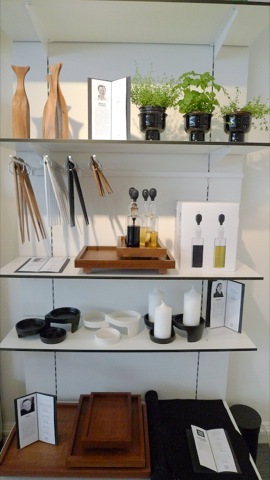 Eye spy a Quistgaard Pepper mill! 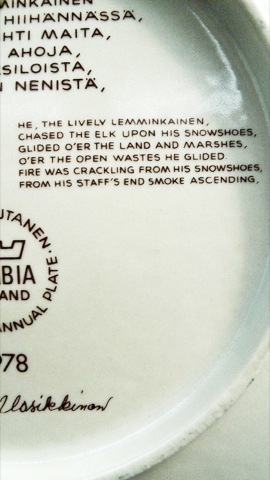 It’s so interesting how rare his stuff is in Scandinavia. Dansk products were mostly only shipped to North America, so it felt like these countries were buying their designs back, but at a premium. I would’ve bought all three of them if I could afford it. Not going to the Fuglen Cafe. We saw it in a copy of Monocle that we picked up at the Toronto airport and completely spaced out. We remembered while we were shopping in Grünerløkka and by the time we remembered and rushed back to our hotel to find out where it was (yes, we checked the newsstand, the new issue was already out), it was closed. As such, we missed out on the Design & Architecture Museum. 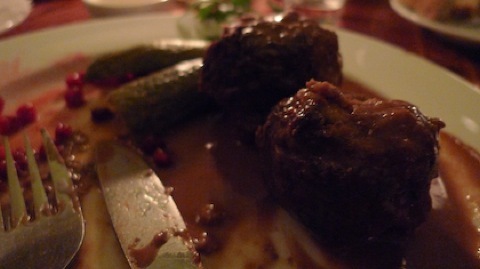 We were going to go after Grünerløkka because it closed at 8pm but once back at the apartment, we ran out of time. Not taking a walk along the river just off of Grünerløkka. Apparently it’s a beautiful walk. Not eating a traditional Norwegian meal. 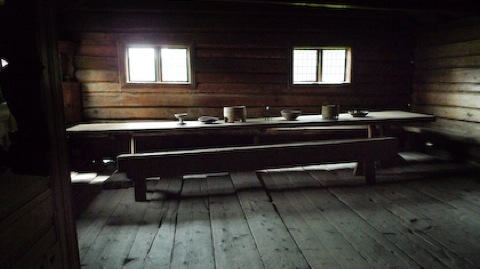 Even a mediocre meal here would cost $200-300 CAD for the two of us, that’s why we got the apartment. We’ll see you in Stockholm! Ok, so we messed up. Oslo deserves and needs more than 3 days of our time. But we don’t have the time to spare. Tomorrow morning we are moving on and we are cranky and depressed, because we’re missing out on too many unseen things. Our biggest time sucker has been our accommodation. I will preface the following with this disclaimer: Oslo Apartments did find us a place to stay, were very apologetic and offered us an even lower rate AND bigger apartments. Even with all the grief we went through, I would stay there again. I booked with Oslo Apartments months ago and we learned at 1pm (after killing time all morning waiting for our apartment) that they mixed up our booking and that we had no apartment. We ended up being shuffled off to another apartment building across town (and another $20 cab ride away, which is crazy because this city isn’t even that big) and ended up waiting for over 30 minutes for someone to let us in, even though they were told we were on our way. I had to look for a telephone booth to speed things along, which was a little bit of torture (smells like urine, phone eats money, impossible to find). FINALLY around 2pm we were in our apartment and after showers, you can see where the day went. We were staying in the Ruseløkka area, so we went to the new House of Oslo. Not too exciting, has a smaller Ilums Bolighus which we’d seen enough of and some other interiors shops that are more generic. 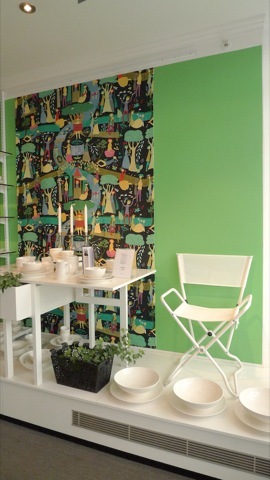 One good store was Designtorget, where John picked up a tea towel he’d been wanting for ages. 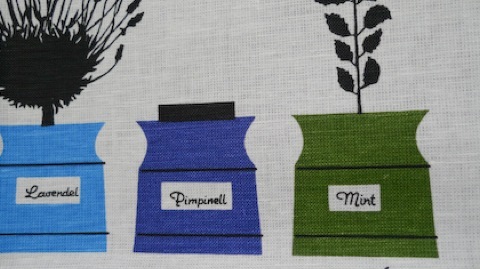 It’s an Astrid Sampe textile design, made in Sweden (above photo). We also bought an egg timer that sits in the pot with the eggs while they boil, since I am terrible at getting John’s soft boiled eggs right (case in point, Tuesday’s breakfast…watery uncooked eggs…had to give up one of my [soft] hard boiled eggs). Tuesday, we took a day off from the shops and ventured over to Bigdøy to check out a bunch of museums. I highly recommend you get an Oslo Pass, from the tourist office, because it covers bus fare and all museum entrances. 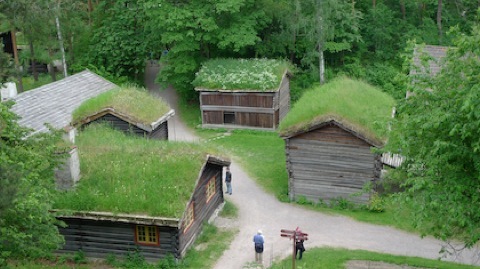 First on the agenda: Norsk Folkemuseum, an outdoor museum with old traditional Norwegian buildings. 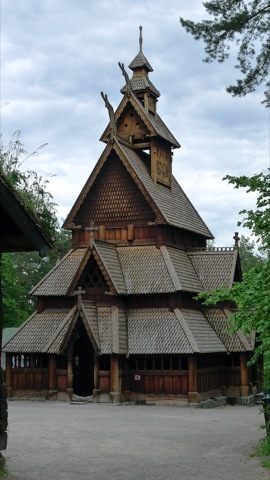 The highlight was definitely the Stavkirke, a church from around 1200. 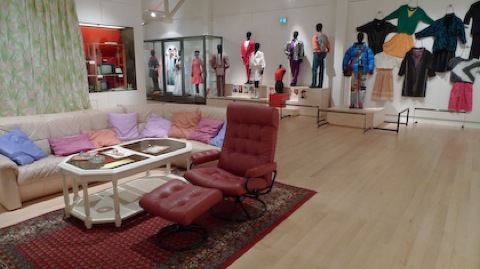 Also, inexplicably, they had a “Back to the 80s exhibit” so of course we had to have a look. John noticed that the coffee table and chaise were virtually the same as what was furnishing our apartment. 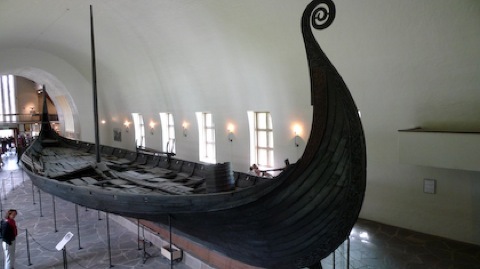 The next stop was the Vikingskipshuset, which has three viking ships on display. Each was buried with a member of the upper class, along with animals, food and treasure (much like the Egyptians did). We stopped for lunch at a nice cafe, then off to the Kon-Tiki Museet. This place baffled us the most but in the end, it was one of our favourites. The museum has original boats and exhibits on many of Thor Heyerdahl‘s (1914-2002) expeditions. A scientist and adventurer, he proved that it was possible for a primitive raft to sail the Pacific with relative ease and safety, demonstrating that the movement of people from continent to continent was possible using what would be considered primitive construction. He also did archeological expeditions on Easter Island and in Peru. 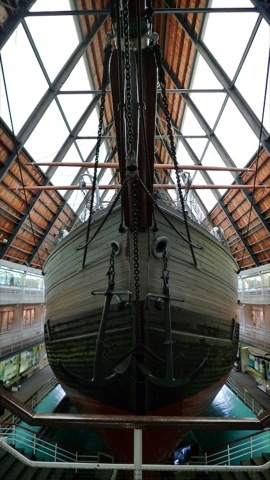 The last stop was the Frammuseet which houses the Fram ship, which was a part of many important Arctic and Antarctic expeditions. The exhibit cover three major explorers, “Fridtjof Nansen’s cross-country skiing enterprise across Greenland and the drift of the Fram across the Polar ocean, Otto Sverdrup’s charting of the Arctic Ocean and Roald Amundsen’s exciting race towards the South Pole.” I was really interested in seeing this one since I am obsessed with Arctic exploration, but the museum was a little on the tired side, in desperate need of some dusting and new info plaques. Also, some of the cool artifacts go unseen because they don’t have pride of place. And the last buzzkill is the storage of office chairs on the ship. Presumably they are for special events or lectures, but they really distract from the realness of the ship. After a busy day touring the museums, we got a $40 take away pizza and settled in for hours of tv watching (in English!) and internet surfing. Why am I still so exhausted!?! We arrived in Oslo early Monday morning. Since we had to wait until noon for our apartment to be ready (boy, did that turn into a disaster), we stored our luggage and headed towards the train station to get some money and substandard food. 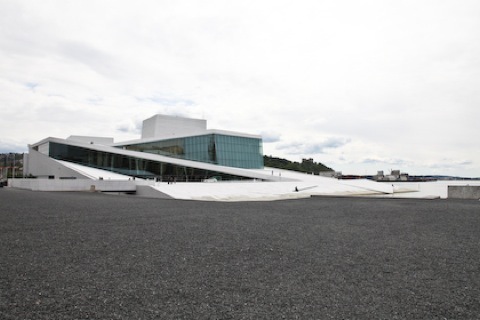 Just off the train station is Oslo’s new Opera House, which opened a year ago. 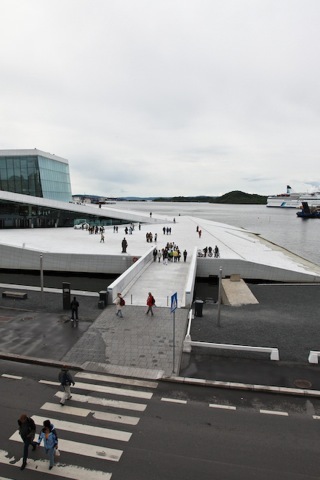 The architect is the Norwegian firm Snøhetta.